Vincent and Keith are a little faster than the other four default characters. Guide is both 7th character (cheat "ope") and Guide Rider (file Guide.dat). 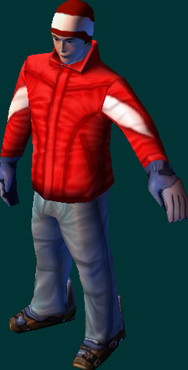 As 7th playable character, Guide is a twin of Vincent, with the same characteristics, only with different clothing. Due to a bug of the game, the original character Guide has no face. The Add-on fixes this bug. In the mode Time Attack the default character of the shadow racers is Vincent. To install Keith as shadow character, edit the file player_types.txt and move the six lines for Keith to the top. You can do the same with any other character.